Just a short review today as I don’t have time for one of my epics, you may be relieved to hear! In all honesty, I also don’t have all that much to say about Devil Dogs of the Air, which is a light comedy-drama, though it does feature some spectacular aviation footage. However, I thought I’d write something about it before it fades in my mind. On the face of it, there are quite a few similarities between this movie , directed by Lloyd Bacon, and one of my favourite James Cagney films, Howard Hawks’ Ceiling Zero, made later in the same year. Both see Cagney playing a daredevil pilot, and both team him with Pat O’Brien as a long-suffering old friend in a position of command. (They are mail pilots in Ceiling Zero, fleet marine force aviators here.) Cagney even makes almost the same entrance in both films. In each case his character has had quite a build-up before he appears, and is first seen in a plane doing daring aerobatics, before cheekily throwing himself into a dismayed O’Brien’s arms on landing. Yet the two movies feel very different to watch – partly of course because Devil Dogs is mainly comedy and Ceiling Zero mainly drama, but also, I think, because Hawks’ film gives so much more complexity to the characters. In Ceiling Zero Cagney’s character, “Dizzy” Davis is in his mid-30s (with a thin moustache to make him look a little older and more dashing), getting rather old to fly and also finding his life of womanising starting to wear thin. It might be included in the Warner Gangsters Collection 3 box set – but the James Cagney movie Picture Snatcher, directed by Lloyd Bacon, is really only a gangster movie in the loosest sense. In fact, I’m starting to wonder if there are any true gangster movies in this collection, since none of those I’ve seen so far really fit the bill. Not that I’m complaining, as they are all fascinating to watch anyway. This film is a very slight offering and I don’t have all that much to say about it, but, as I’d eventually like to write at least something on this blog about all of Cagney’s movies, here are a few thoughts on this one. 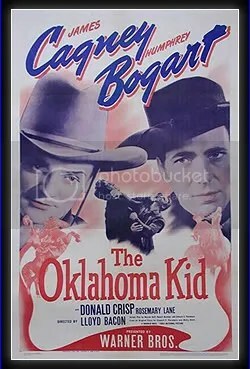 Cagney and Bogart leave the mean streets of New York far behind them in this mainly lighthearted Western – which I’d say is a must for fans of either or both. Cagney seems to enjoy himself as a mixed-up outlaw, who turns out to be a hero almost by mistake. Unfortunately, Bogart doesn’t have such a good role to get his teeth into. This was made only a year after Angels With Dirty Faces and he is really playing the same type of sour-faced bad guy he played there, obsessed with money and killing to get it – or, rather, getting other people to do the killing for him. The only good thing about his character is that he has a truly great name, Whip McCord! As in Angels, Cagney really seems too nice to be a criminal, and is mainly seen acting as a vigilante rather than a thief.